Former EPA Administrator Scott Pruitt may be gone, but Capitol Hill Democrats want to make sure he's not forgotten when the agency's annual spending bill hits the House floor next week. House Democrats will try to force a floor vote on an amendment to the fiscal 2019 Interior-EPA spending bill that would block the administration from issuing any new rules made under Pruitt's watch until the agency's inspector general completes its review of any potential misdeeds related to his tenure. Pruitt faces multiple probes related to his spending, security detail and use of agency staff for personal work. The mounting investigations led to his resignation earlier this month. Democrats see the amendment as a way to keep the erstwhile administrator in the spotlight, even as acting Administrator Andrew Wheeler has moved quickly to usher in a new chapter at EPA. The House Rules Committee will meet early next week to weigh whether the Pruitt provision and 122 other amendments proposed on a variety of EPA-Interior spending and policy issues will get floor votes. Generally, only a fraction of the amendments proposed are considered on spending bills, and the GOP majority has free rein to decide which ones. Several proposals from both parties that would block or severely limit offshore drilling or related activities along the Eastern Seaboard and in parts of the Gulf of Mexico. A Democratic proposal to strike language to repeal the Clean Water Rule. A Democratic proposal that would deny spending for energy exploration in the Arctic National Wildlife Refuge. A Democratic proposal that would strip all provisions from the bill limiting implementation of the Endangered Species Act; GOP provisions would seek to put new limits on ESA spending. A Republican proposal that would block an Obama-era rule limiting methane venting from being implemented by the Bureau of Land Management. A Democratic proposal that would limit the Interior Department reorganization by blocking the transfer or reassignment of senior personnel. The House's $35 billion spending bill for EPA, the Interior Department and related agencies is equal to the funding level Congress enacted in fiscal 2018. It is also $7 billion more than the Trump administration requested in its latest budget proposal. House GOP leaders are pairing the Interior-EPA bill with the annual financial services spending measure in a floor package. They have been moving bills in clusters as part of an effort to have all 12 passed before the new fiscal year begins on Oct. 1. House and Senate conferees are hoping to make quick work of the first package of appropriations bills to clear both chambers this year that contains fiscal 2019 energy and water spending. The Senate yesterday cleared the way for the conference to begin today by picking appropriators to engage in negotiations with the House. Senate conferees include Appropriations Chairman Richard Shelby (R-Ala.), top Democratic appropriator Patrick Leahy of Vermont, Energy and Water Subcommittee Chairman Lamar Alexander (R-Tenn.) and subcommittee ranking member Dianne Feinstein (D-Calif.). The House named its conferees last month, which also include senior energy and water appropriators. They are not expected to finalize the package today, but rather offer a statement before talks move behind closed doors. Alexander told E&E News that Senate leaders have told conferees they would like to see a final deal within seven to 10 days. "I don't want to advertise differences," said Alexander, adding that a few funding levels and policy provisions would need to be settled. Perhaps the biggest difference is the House's proposed spending of $44.7 billion for energy-water versus the Senate's $43.7 billion. Both figures are well above the president's request and would reject the administration's calls to cut funding for the Advanced Research Projects Agency-Energy. Alexander stressed energy and water appropriators have a reputation for bipartisan dealmaking and that's one of the reasons the bill is among the first ones advancing this year. Aside from energy-water, the minibus also contains the military construction-veterans affairs and legislative branch measures for fiscal 2019. Those two bills rarely generate much controversy. While approving conferees, the Senate also passed two nonbinding instructions for the talks. One would require extending the current National Flood Insurance Program by six months to avoid any lapse when the new fiscal year begins on Oct. 1. The extension, proposed by Sen. Bill Cassidy (R-La.) 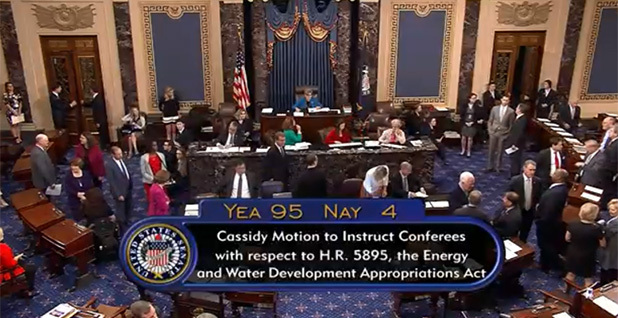 and adopted 95-4, is aimed at buying more time for the long-delayed reauthorization of NFIP. The other would require the president to submit to Congress for approval within 60 days any tariffs proposed under his national security authority. The nonbinding move is a swipe at the trade barriers President Trump has recently leveled as part of an escalating dispute with China and other nations. The motion, approved 88-11, signals the Senate may be eyeing binding legislation to block some of the president's trade moves. Currently, Capitol Hill does not need to sign off on some levies made on national security grounds.